The third day of the 2018 European Association for the Study of Diabetes (EASD) Conference featured some incredible data on exciting diabetes therapy developments and also some technology highlights. Usually technology is not such a focus here at EASD (this is our 15th year going!) but this year we’ve seen more! Please note that nearly all the video presentations at EASD are available free on the EASD website from Berlin and we say thank you to all these researchers for making so much happen – and to this incredible EASD organization! Click to read more about these headlines from Berlin! And stay tuned to hear more about our event in Berlin and check #dTSolvableProblems on Twitter! What is “normal” CGM Data in Adults and Kids Without Diabetes? A new kind of drug called a “dual GIP and GLP-1 receptor agonist” made waves with exciting A1C lowering and weight loss trial results. The medication, a once-weekly injectable for people with type 2 diabetes, is believed to increase the efficacy of GLP-1 by changing how fats are broken down via the added GIP component. In fact, the three highest doses of the dual agonist were all superior to Trulicity in terms of A1C and weight loss. However, these results were often accompanied by mild to moderate side effects including nausea, diarrhea, and vomiting. Though not substantially different than the side effects associated with traditional GLP-1 agonists, these could be mitigated by more slowly transitioning from a lower dose to a higher dose. The trial was phase 2, meaning that an additional trial (a phase 3 trial) will need to take place before the drug could be considered for regulatory approval. See this 2009 article in which diaTribe discusses regulatory science and the regulatory review process in the United States – Dr. Lisa Rotenstein and Dr. Brendan Milliner wrote this article before they were in medical school and all their learning benefits us enormously today! Benchmarks for excellent control in type 1 diabetes might be an average glucose of less than 154 mg/dl and time-in-range of 70%. These findings show how far we have yet to go in normalizing blood glucose in diabetes! Even automated insulin delivery is still pretty far from what people without diabetes experience. 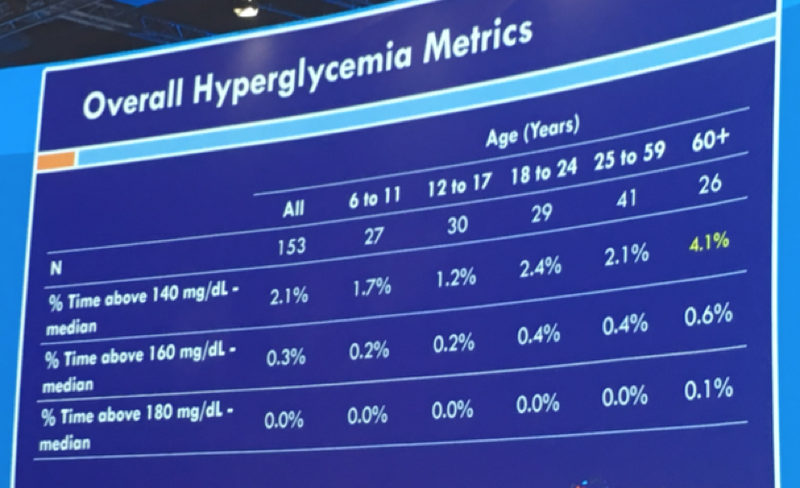 According to Dr. Beck’s, this data further support consensus around 54 mg/dl as a meaningful hypoglycemia cutoff point for research, clinical, and regulatory evaluation. These findings may also suggest that a hyperglycemia threshold of 140 mg/dl is where the field should push over time. To learn more about time-in-range goals and CGM, see Kelly and Adam’s interview with 15 researchers late last year to see what they think about this subject … CGM and Time in Range: What do the experts think? Time-in-range (70-180 mg/dl) improved from 52% to 65% on closed loop (+3 hours/day) vs. a small 52% to 54% improvement with SAP (+29 minutes); wow, 180 minutes vs. 29 minutes! Notably, this study (published in the Lancet) is the largest randomized study of closed-loop use in outpatient settings so far. 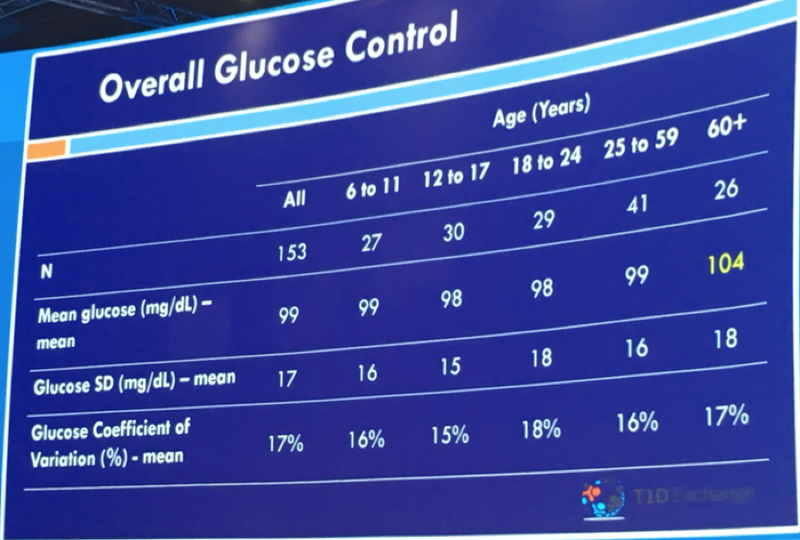 Results from two EASE (Empagliflozin as Adjunctive to inSulin thErapy) trials showed that, in people with type 1 diabetes, a very low dose of SGLT-2 inhibitor Jardiance lowered A1C with less diabetic ketoacidosis than higher doses. However, as would be expected, the A1C lowering, weight loss, and time-in-range benefits were also reduced with the lower dose. Since that is the main point of taking an SGLT-2 – to have better glucose management – we are unsure whether the 2.5 mg dose would be attractive to many. That said, this is a very important study to understand what the optimal dose might be – how can we balance effective glucose lowering and weight loss and reduce DKA risk? 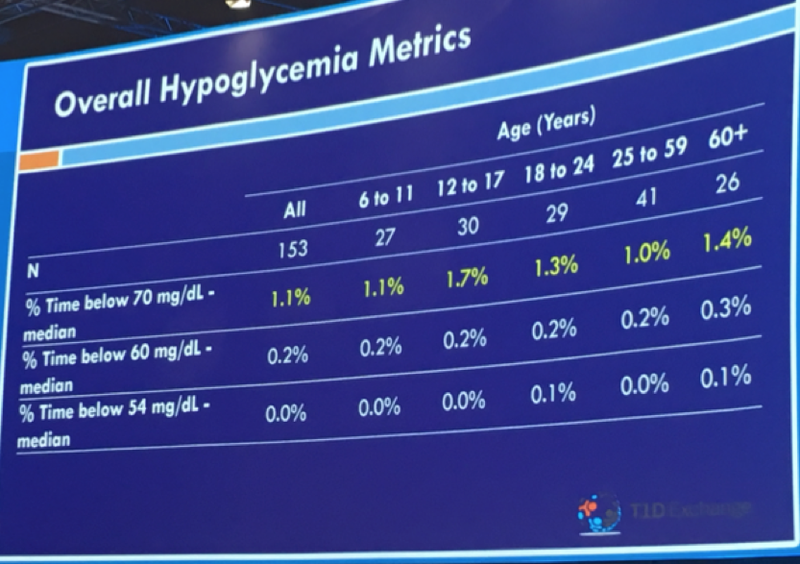 We personally have been very excited to better understand what safety guards have been discussed to reduce DKA in other ways than lowering dose – see the slide that Dr. Lori Laffel showed with her recommendations that mirror some of the best ones we’ve heard from Dr. John Buse and Dr. Anne Peters. As a reminder, Jardiance is a pill currently approved only for people with type 2 diabetes. Reduced A1C by an average of .3% more than placebo (a “nothing” pill), while the 10 and 25 mg doses both reduced A1C by about .5% more. Resulted in an average four-pound weight loss, compared to seven and eight pounds in subjects who took the higher doses. Significantly improved time-in-range, lowered total daily insulin dose, and decreased blood pressure, though again not to the degree of the higher doses. Alongside this lowered efficacy, the low dose of Jardiance caused less diabetic ketoacidosis (DKA) than placebo – this is what we would have expected and it is great to see – less potency, but fewer adverse events. 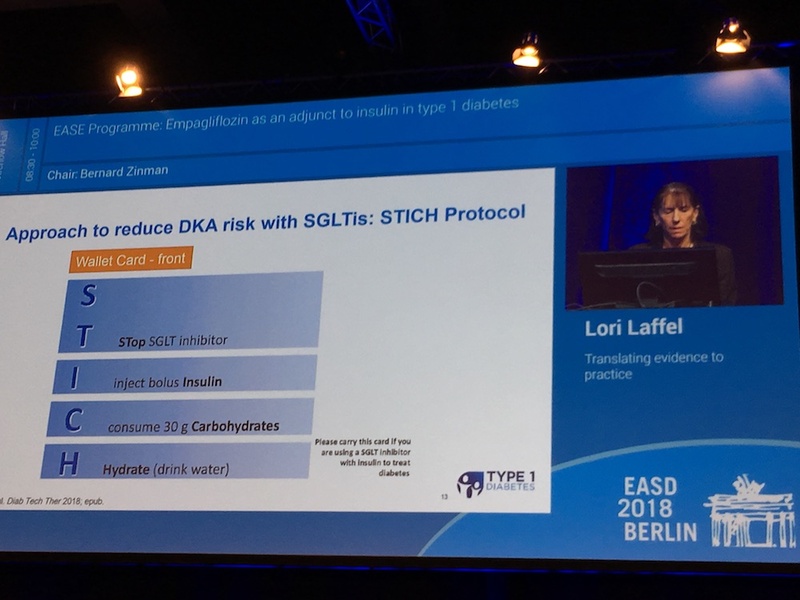 While there has been a higher risk of DKA that has been found in other SGLT-2 inhibitors used in type 1 diabetes, lower doses of these compounds have not been tested. Interestingly, the trial found higher rates of DKA in females and pump users, which means that these could be risk factors to consider when considering starting an SGLT-2 inhibitor – the pump use absolutely makes sense since DKA is a bigger risk with pump users anyway. The higher number of women is a surprise and we’ll be eager to learn more about what researchers think there. To address DKA risk, individuals at high risk of DKA should monitor their ketone levels, even when not experiencing the classic symptoms of DKA (thirst, frequent urination, blood glucose above 240 mg/dL) – more recommendations to follow.